Dairy farmers help protect air quality by following proper manure storage practices and by maintaining clean farms. Do dairy farmers care about air quality? Yes, dairy farmers care about air quality. Their families live and work on their farms and breathe the same air, too. Ohio and West Virginia dairy farmers understand the importance of clean air for future generations. What is being done to manage odor and air pollutants from farms? Ohio and West Virginia dairy farmers regularly clean their barns and recycle manure to help control odor in the community. Additionally, dairy farmers follow a nutrient management plan to store manure properly. Dairy farmers also invest in new technologies to further protect and improve air quality. Is odor more of a problem on large farms? Naturally, there are odors associated with any dairy farm — large or small. 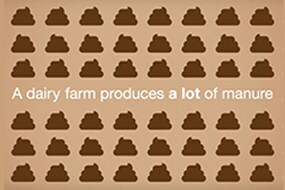 While it’s true that with more animals comes more manure, all dairy farms must have a manure-management program in place. Dairy farmers implement best management practices to ensure that odors are minimized as much as possible. Many large farms also use technologies like “digesters” to reduce manure odor.